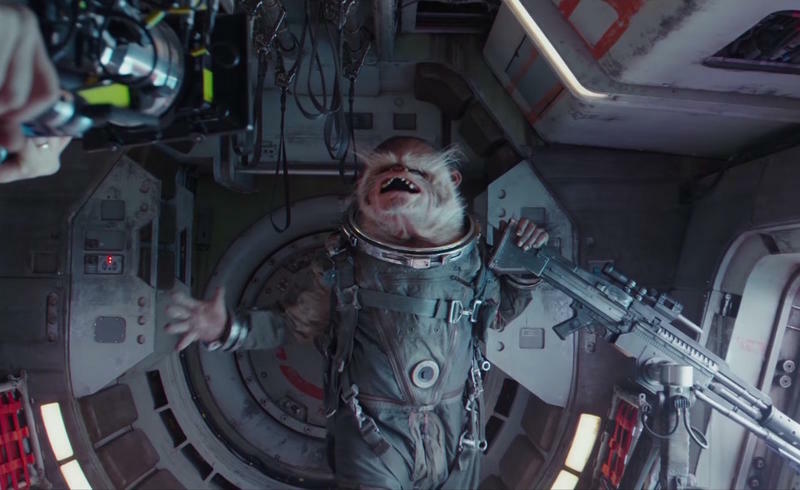 We finally know more details about Rogue One's "Space Monkey"
Last week, director Gareth Edwards revealed a cool sizzle reel showing off new behind-the-scenes footage from Rogue One: A Star Wars Story, and while it was full of brand new aliens, one in particular has already won fans over: Space Monkey. Now, just a few days removed from his triumphant debut, Lucasfilm story group executive Pablo Hidalgo has revealed more details about who this alien is. Turns out his name is not Space Monkey, but Bistan and he’s part of a species known as the Iakaru. We actually got a look at this character in some leaked Rogue One assets back in May and it’s nice to finally know more about him. According to Hidalgo, Bistan is a member of the Rebel Alliance and mans a gun aboard the U-Wing, which is new to the Star Wars universe. If you haven’t already, check out the sizzle reel unveiled at Star Wars Celebration last week. Additionally, the gallery above reveals the other new aliens you can expect to appear in Rogue One, which is currently scheduled for a Dec. 16, 2016 release.